Wondershare iPhone Video Converter helps you to convert video files to formats supported by the Apple iPhone. 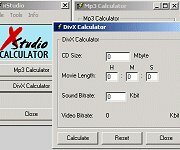 1st stable version of xCollect a DivX-) Db successor is finally available. xCollect helps you to manage your movie and games collection. (Books collection is work in progress). XULPlayer is an open source media player built on Mozilla XUL and MPlayer. It intends to be a flexible, user-friendly and web-enabled media player with support for playback of most popular audio and video formats.